Not much academic research has been conducted on the subject of decentralised cooperation in Europe. Yet, it is an area in constant development that is receiving new attention, notably in connection with the 2030 Agenda for sustainable development and its new approach to global development. That is why PLATFORMA has decided to publish a study based on the doctoral thesis of Mary Gely, Doctor of Territorial Sciences at the Toulouse 1 University Capitole (France). 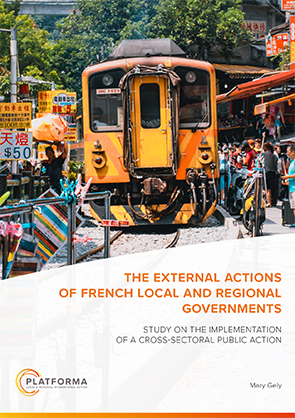 The publication “The external actions of French local and regional governments” aims to highlight the reasons and the ways in which external actions of French local governments are currently implemented. Indeed, despite a “strained” context, local and regional governments continue to develop international actions. While the concepts of reciprocity and “win-win” partnership are emphasised in official speeches, what about the impact of these foreign actions for local French territories? This doctoral thesis is based on an immersion work placement, the study of the organisation charts of 150 French local and regional governments and 56 interviews with officials working in 33 distinct cities and regions (from different levels).